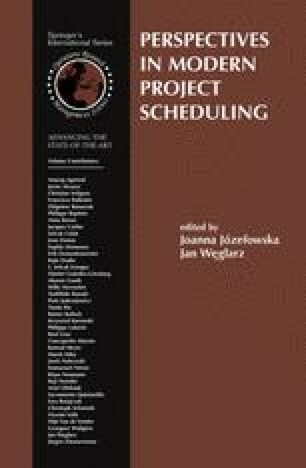 In the last few years several heuristic, metaheuristic and hybrid techniques have been developed to solve the Resource-Constrained Project Scheduling Problem (RCPSP). Most of them use the standard activity list representation, given that it seems to perform best in solving the RCPSP independently of the paradigm employed (genetic algorithms, tabu search, simulated annealing, ...). However, we have designed an innovative representation, one which has not been used before and which includes a lot of problem-specific knowledge. Based on that representation we have developed a new competitive and robust hybrid genetic algorithm, which uses genetic operators and an improvement mechanism specially designed to work on that representation and exploit, in a very efficient way, the information contained in it. We have compared this algorithm with the best algorithms published so far, using the standard benchmark of PSPLIB. The results show the excellent performance of our algorithm.